Currently ml.wikipeda sites lost all of its namespace aliases and many pages including main page was / is broken. Some are manually edited to fix. Please reinstate all namespace aliases. For now, I am not if sure any other sites affected. bzimport set Reference to bz58074. Perhaps related to that issue where localization was rather wonky earlier today? ml.wikisource, ml.wikiquote, ml.wiktionary also affected. Alias ഉ (for ഉപയോക്താവ് - user) worked on ml.wikibooks! ഉ is indeed still defined in my.wikibooks namespace configuration as an alias for NS_USER, untouched since 2012. This is not a configuration file issue. praveenp: When did this still work as expected? 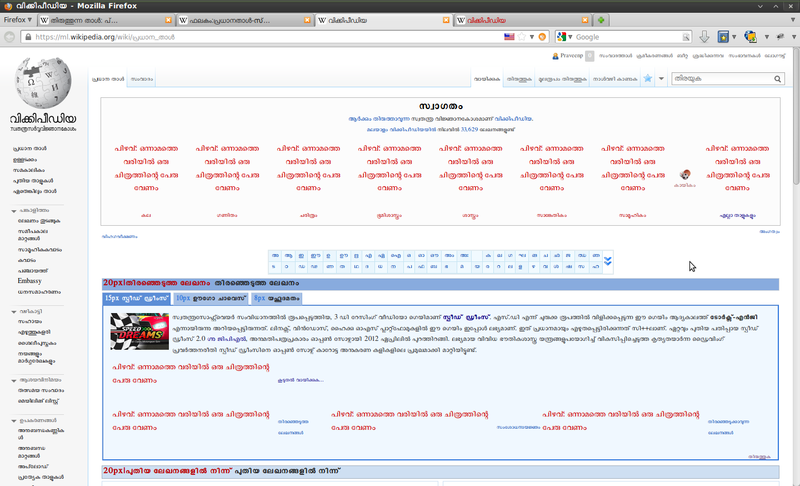 ഉപയോക്താവ് - user) worked on ml.wikibooks! but even an old version (I checked a three weeks old one) did not define this NS_USER for any other ml sites than wikibooks, as Dereckson wrote in comment 3. I don't know when was this last worked. Users only notified yesterday that Main Page is broken. I think nothing was wrong before that. Please see the bug 24601 also. However some aliases like 'Image' for 'File' namespace works in ml.wikipedia and other projects. That is because these aliases are defined in MediaWiki core . They have been there for at least 12 months. I set my local test wiki to Malayalam and the aliases work as expected. I have no idea why they are now not working on the WMF cluster. Sounds like a rebuildLocalisationCache SNAFU. Those are rare, and not well understood. I don't know about this. Are there details anywhere? Maybe Sam or someone else from Platform can force a localisation cache rebuild and scap that? If possible please include these in configuration files in the meantime (like ഉ in ml.wikibooks - Comment 3). Too many pages / links are affected and so this issue is a clear inconvenience to users. Some pages are still displaying correctly, although updating cache using ?action=purge would break them simply. Regarding priority: this is a pretty big deal. If this was happening to enwiki you would easily have a mass of people screaming bloody murder. @Brian: translatewiki.net has nothing to do with this as far as I can tell. There have not been changed in namespaces of MessagesMl.php recently. I've changed back to the previous summary, for lack of a better one. IMO Platform really has to look into this. I don't know how to surface that any more here in bugzilla than by my previous comments, so I'll start poking outside of bugzilla now. This, and the information from comment 6 indicate that there is an issue with the localisation cache at Wikimedia, as also mentioned as a suspicion in comment 7. My recommendation is to force a localisation cache rebuild for "ml" and to distribute that. I think bug 54951 revert is deployed but still pages are broken because of cache. Is it possible to mass purge the entire cache (of all these wikis)? @Praveenp: is this still occurring? if not, could you mark this bug RESOLVED FIXED please? There are still broken pages. (eg: https://ml.wikipedia.org/wiki/%E0%B4%95%E0%B4%A3%E0%B5%8D%E0%B4%9F%E0%B4%82%E0%B4%95%E0%B5%81%E0%B4%B3%E0%B4%A4%E0%B5%8D%E0%B4%A4%E0%B4%BF_%E0%B4%86%E0%B4%B0%E0%B5%8D%E0%B4%AF%E0%B4%B5%E0%B5%88%E0%B4%A6%E0%B5%8D%E0%B4%AF%E0%B4%B6%E0%B4%BE%E0%B4%B2 ). It is possible to fix them by purging cache. I've just manually purged the few hundred remaining pages, so that this issue should be fully resolved now.